Just 12 months after a Supreme Court ruling in favor of PPACA and an Obama victory at the polls, nearly 80 percent of benefits professionals now believe PPACA will be implemented fully. When we surveyed benefits professionals early last year, they remained dubious about the Patient Protection and Affordable Care Act, with roughly two-thirds of them predicting the legislation would be scaled down or overturned altogether. Just 12 months later—12 months that included a Supreme Court ruling in favor of PPACA and an Obama victory at the polls—they’ve changed their tune. 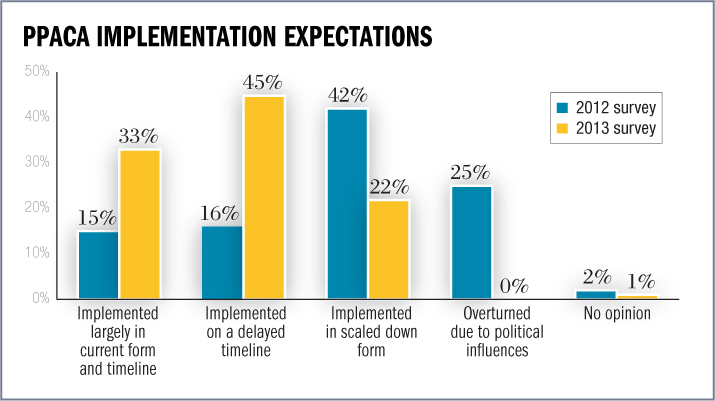 Now nearly 80 percent of benefits professionals believe PPACA will be implemented fully sometime next time.